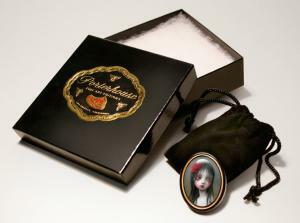 Enameled metal lapel pin features Mark Ryden's "Rose" from his exhibition, "Blood: Miniature Paintings of Sorrow and Fear." The back is custom stamped with Mark's logo and has a butterfly clutch attachment. The pin comes in a black velvet pouch and special Porterhouse box with a certificate of authenticity.